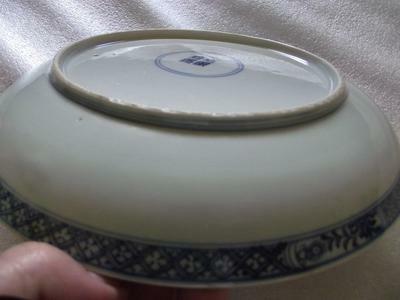 Kangxi Plate/ Dish or later? I would love to get your thoughts on a great plate ( yet another) that i found whilst Car Booting. I bought it about 5 weeks ago and have still not quite satisfied what it actually is. When i first found it i thought it to be 19th century but now i do not know what to think. I am confused by the mark which looks Kangxi but i have not seen another like it. When i physically compared it to others in my collection which i know for definate to be 18th Century I have to admit that the colour of the glaze ( and imperfections), the blues and the look and colour of the unglazed foot look promising. So we go back to the mark again, i thought looked 'iffy', i know the double ring mark was used widely in the 19th century aswell as the Kangxi period. So, I am stuck again! Either way its a stunner even with the staple repair ( which also would suggest if nothing else that it has not been made in the last 80/90 years) i would be happy either way. It only cost £3.50 and it has given hours of fun in the reseach! I did find one very similar that was sold at a large Auction House in California but was slightly smaller but similar design and exact same mark. 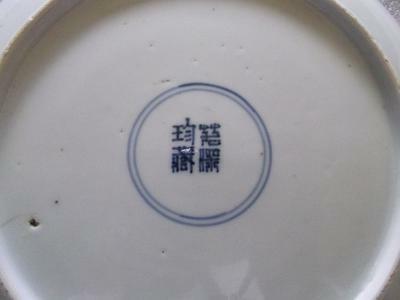 This was indeed sold as Kangxi mark and period. The store holder gave me another plate, Kangxi Famille Verte which was sadly broken into into 7 pieces and re glued- such a shame... I always find these old broken/ damaged plates which cost next to nothing such a god send when comparing new finds- far better than any book or internet research. Anyway, have taken some pictures and would love to hear your thoughts. The design is unusual aswell, i'm sure it must represent a story but again I have found nothing. Comments for Kangxi Plate/ Dish or later? I have several doubts that this is Kangxi, it is more likely later. First the double ring says not much regarding the era. Double ring marks have been used since the Ming dynasty, but were less frequent from the Qianlong to the Tongzhi reigns. In the Guangxu reign it appeared frequently on export items. The character style is a bit off the normal, but I can clearly read the left side, which says "zhencang". The whole seems to be a "Ruoshen Zhencang" (若深珍藏) mark, used in the Kangxi and Guangxu reigns, but normally not written in a circle, and in a different character style. That said, the painting itself also makes be doubt a bit. Apart from the two ladies, the other people look more as they do on copied items, especially the one sitting on the wheel chair (proportions), and the one on the left (too detailed and life-like). 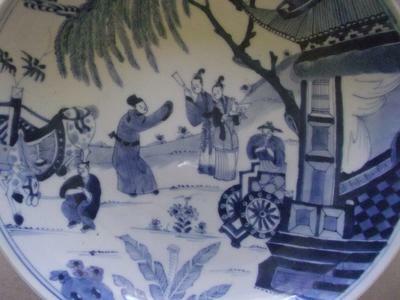 The different levels of blue used on Kangxi items can be copied. Except the latter and the thin, tall shape of the ladies, I can really see nothing that points to Kangxi specifically. You cannot rely on the age of staple repairs. Here in Taiwan staple repairs were made until the mid 20th century. In mainland China it is likely much longer. And staple repairs are also part of the age faking, so new one are still being made. The main problem I see, however, is with the foot rim. If this was 18th century, then the exterior face, or both the exterior and interior face of the rim should be oblique (not vertical up but at an inward angle). I fail to see that in the pictures. That would mean it would have to be 19th century or later. I must admit that the bottom looks old. That is all I can say from these pictures. For some reason I do not feel comfortable with the decoration. It gives a completely different "feel" from other authentic items I know. It could also be the blue pigment used that confuses me. 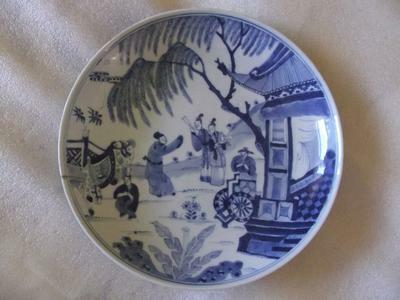 Do you have a picture or link of the item sold at Auction? Would be interested to see that.